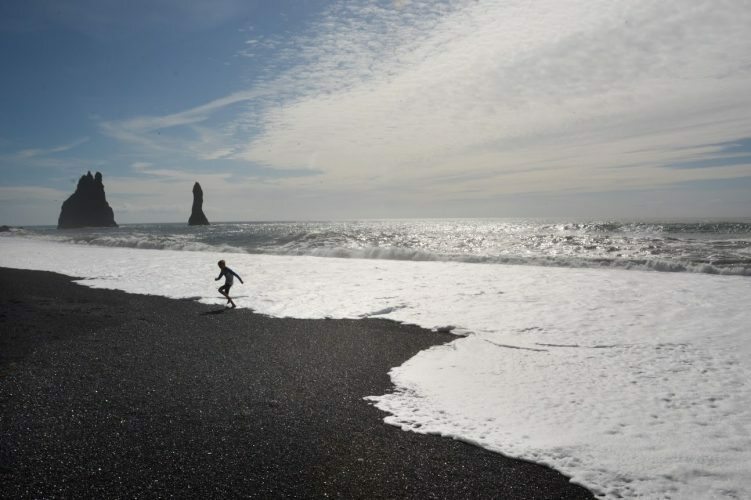 A child races the waves at Dyrholaey, Iceland. Monica Schimanke photos. The rain had finally stopped. I could see my breath inside my tent, but my watch read just 4 am. Icelandic horses are friendly and will often come over for a visit. It was an early gray Icelandic morning and quiet as a church. I didn’t dare get up, sure to get hit by the bitter cold, but lying there was unbearable, bundled up yet still freezing. So much for my brand new hi-tech sleeping bag’s rating of -20C. Months earlier, I decided to stop in Iceland on my way home from Europe. Going solo during the height of travel season meant hotels were out of the question. Over 1.7 million people traveled to Iceland in 2016. Home sweet home – my first night outdoors was at the campground at Hvammstangi, a small northern village. Visitor numbers are increasing yearly, and hotels and guesthouses are often booked months in advance. The resulting high prices can make a trip for a single traveler on a budget impossible. Researching my options, I realized camping would make it possible. Planning my trip months earlier, I thought, “It’s August, how cold could it be?” I was in for a surprise. I arrived in Reykjavik, Iceland’s capital city, on July 31, on a windy, sunny, and cool afternoon. 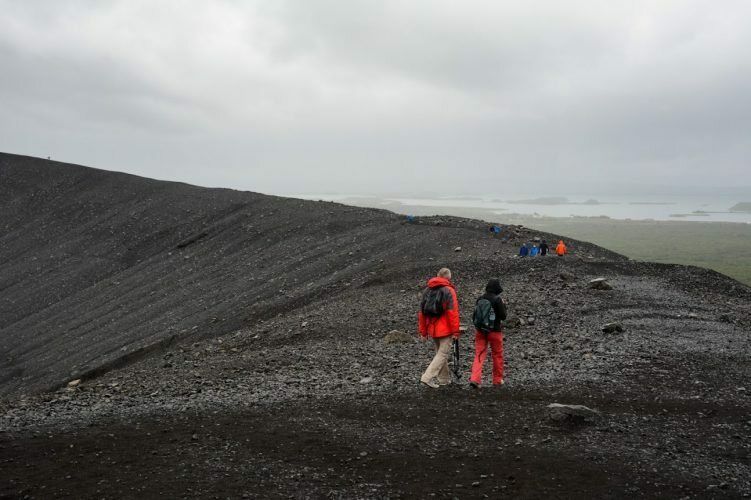 It’s a fair climb to the top of Hverfjall, an extinct volcano crater, but it’s a great opportunity to see the surrounding landscape. Hikers can circle the entire top of the crater. Europe and now to Iceland. Paying the extra baggage fees was still cheaper than renting camping equipment or a camper van. Early the next morning, after my first night in a guesthouse, I loaded up my rental car and found a supermarket for supplies. By mid-morning, I was heading north along Route 1, armed with a road map and no solid itinerary. Also known as the Ring Road, the 1300 kilometer two-lane highway circles the island. To see the Island’s western region, the Westfjords, you have to leave the Ring Road. Drivers must be attentive, as sheep are common on the highways. My first night was spent at a campsite at Hvammstangi, a small northern village of 580 residents. Not more than a flat field, the location was impressive, with an old church, a large rock face and waterfall nearby. The average for summer daytime temperatures in Iceland is 10-15C, pleasant if dressed accordingly. The temperatures drop at night and with the wind, it can feel below freezing. After that frigid first sleep, a few items were in order. A well-stocked gas station supplied new gloves and a wool hat, and another shop provided a nice thick blanket to cover my sleeping bag. 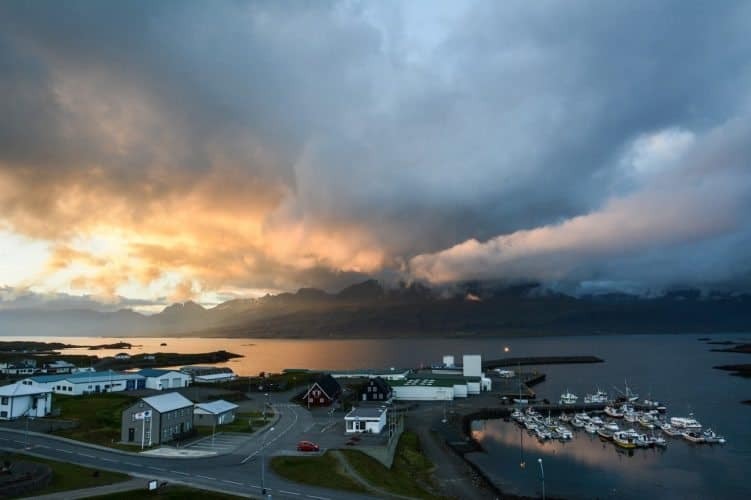 Evening clouds roll in over Djupivogur. My upgraded gear was worth the expense and made my remaining nights outdoors pleasant and enjoyable, despite the cool temperatures. One of the glaciers along the southern part of the Ring Road. 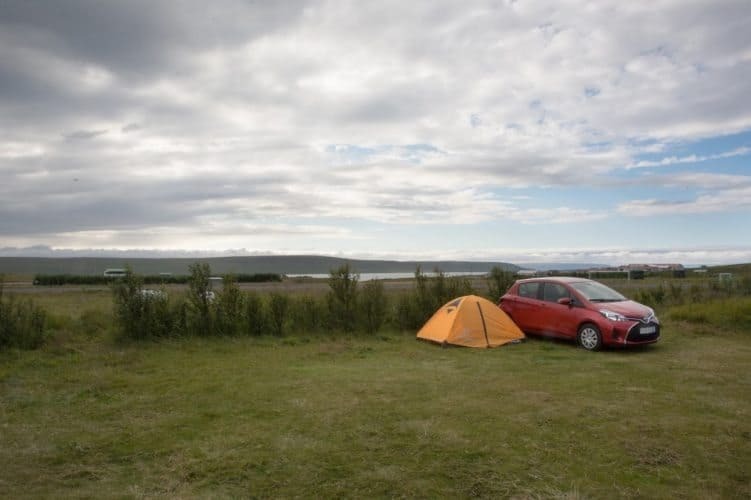 There are over 200 campsites in Iceland, so finding a place to pitch a tent or park a camper is easy. If there is no campsite nearby, travelers can stay anywhere except near residential buildings, cultivated land, and protected areas. Camping away from sites is restricted to one night, and common sense and respect are advised when deciding where to stop. Campsites vary and most are well equipped and offer great amenities. No fires are allowed, and meal preparation is usually done at the central camp house. Some camp houses are indoors, clean with running water, stoves and cooking utensils. Others are outdoors with a roof, cold, cramped and busy. They also provide showers, laundry facilities, and most have wifi. 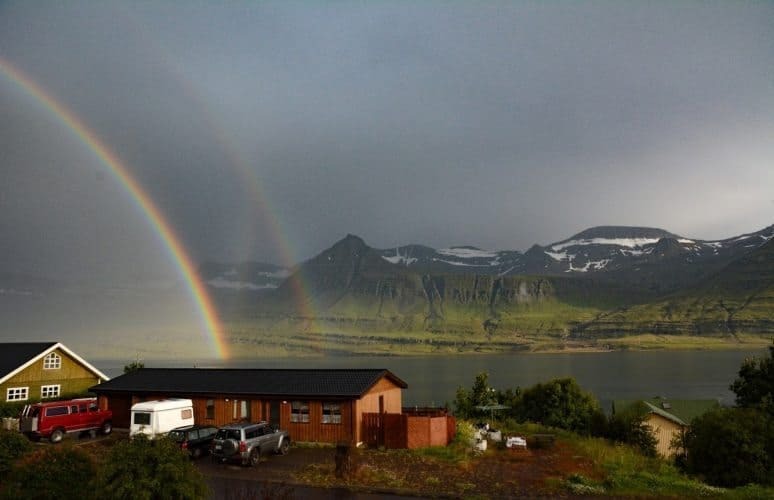 A double rainbow is the reward after a rainy day at Eskifjordur. A major benefit of camping is meeting other travelers from around the world. The common bond of living outdoors and being in the elements, means conversations tend to start a little bit easier. I was impressed by a young couple from Quebec, Canada, who were spending 4 weeks cycling across the southern part of the island, towing their 8-month-old son in a trailer. I envied their experience as they described the beauty they encountered, their two wheels giving them more time and opportunity to see the countryside in detail. 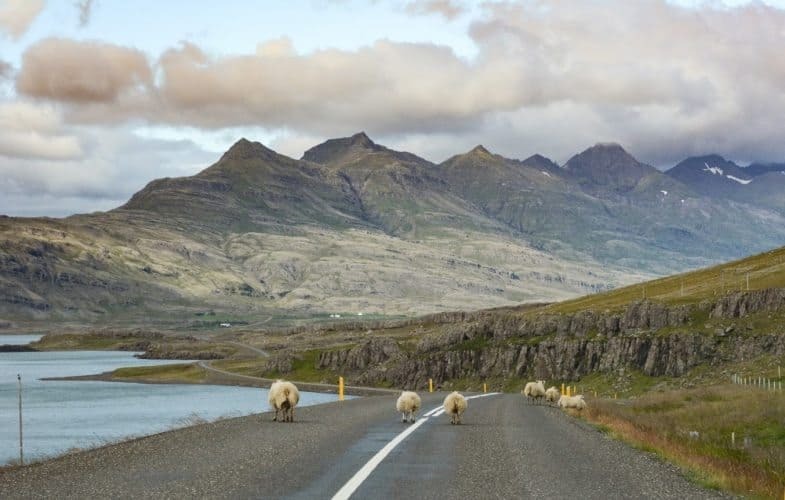 The northern and eastern sides of Iceland had fewer travelers than the south, making driving there easy and pleasant. Tourist attractions along the highway are busy but worth stopping for. 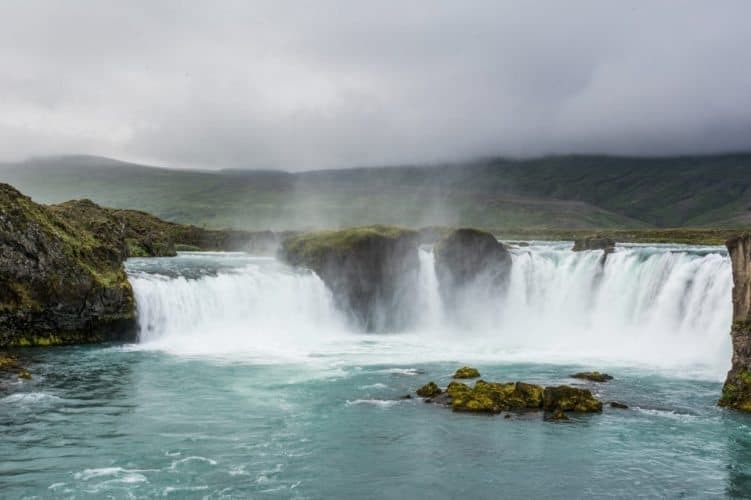 Godafoss waterfall, at 12 metres high and 30 metres wide, is one of Iceland’s well-known falls. A short hike will take you to the site where the Skjálfandafljót River makes its impressive drop. 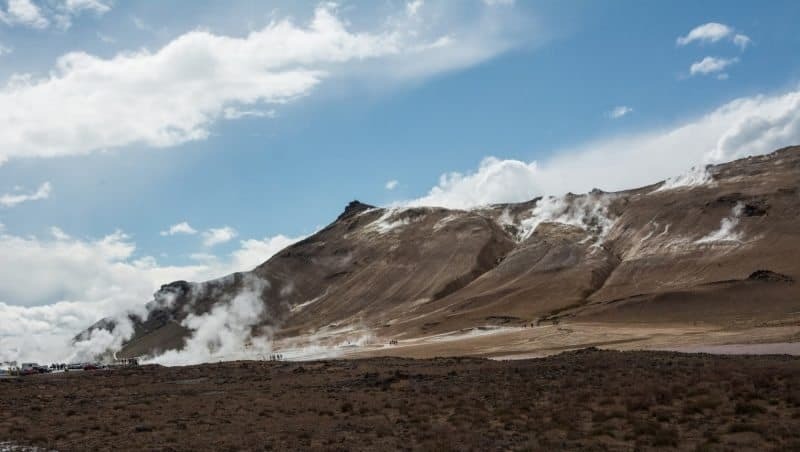 Steam rises from the mountains in the active geothermal area at Namafjall Hverir, while fumaroles, mud pools and mud pots bubble away at the bottom. The area around Lake Myvatn, in the northeast region of Iceland, has much to keep visitors busy for a few days. Climbing Hverfjall, an extinct volcano crater, provides a good workout. Those making it to the top, at 396 meters, will be rewarded with incredible views. East of the lake is Namafjall Hverir, an active geothermal area, with fumaroles, mud pools and mud pots bubbling away like soup on a stove. Be prepared – rotten eggs have nothing on the smelly vapors coming out here. It’s easy to think of otherworldly landscapes as the steam rises out of the nearby hills. While the major attractions have their rewards, scenic villages, mountain areas, and wide-open spaces are as interesting, and with fewer visitors and more room. One sunny morning I spent hours beside the ocean along the north coast, on a glistening black sand beach. I was alone in the brisk sea air, the sun sparkling off the water, only hearing the roaring sound of crashing waves. Long empty beaches like this are plentiful. 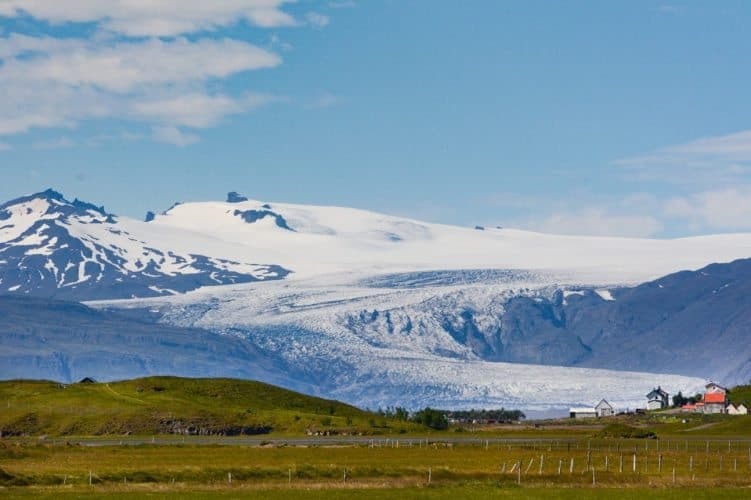 With no warm hotel room and television tempting me to stay indoors, I saw more of Iceland than I would have by staying in commercial accommodations. I spent more time outdoors exploring and hiking. I spent an afternoon climbing high into the mountains near Eskifjordur, along the east coast. The expansive valley spread out for miles below, as vibrant and green as emeralds, the empty highway snaking its way through the center. The overcast pink sunrise at Djupivogur, a small eastern coast fishing village, was a highlight of my trip. Sitting on top of a hill near the campsite one early morning, watching the clouds above and the boats in the marina below, I felt like I was the only person awake. Along Highway 1, approaching the south coast, is the Glacier Lagoon, another stop recommended for Island visitors. 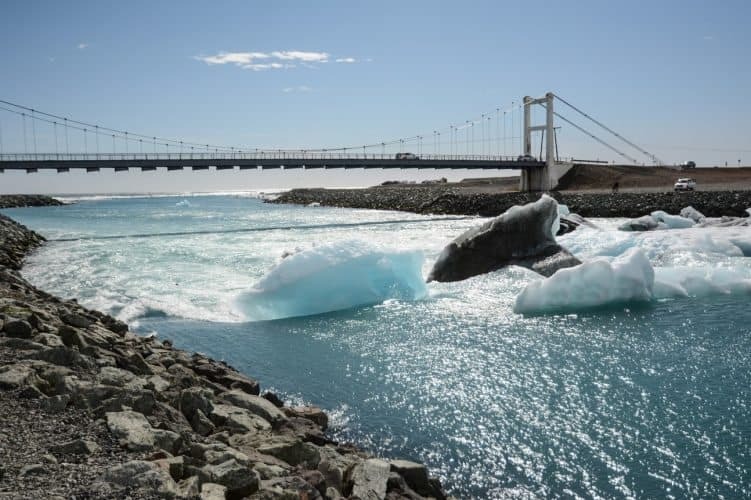 Giant chunks of ice break off the Breiðamerkurjökull glacier, and float through the lagoon, on their way out to the Atlantic ocean. 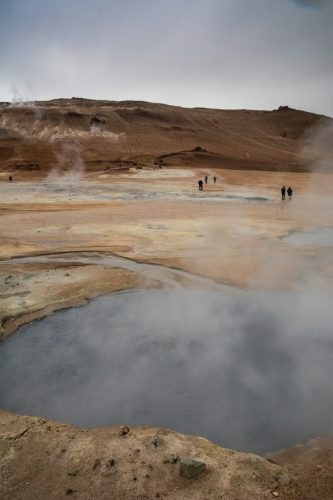 Despite the strong sulfurous odor, the active geothermal area at Namafjall Hverir, with fumaroles, mud pools, and mud pots, is an interesting visit. The surface of the lagoon is at sea level and water flows in at high tide. Seals play in the rushing waters as it flows back to the sea. Adventurous visitors can book a boat ride out among the floating icebergs. After several rainy nights and chilly mornings, I splurged for a roof over my head and stayed in hostels a few times. Hostels in Iceland are a great option for travellers on a budget, but those outside of Reykjavik are much more affordable. They are often fully booked, so it’s important to check for availability early. They generally don’t move in a hurry, and oncoming cars and honking horns doesn’t mean they’ll go faster. Patience is necessary. 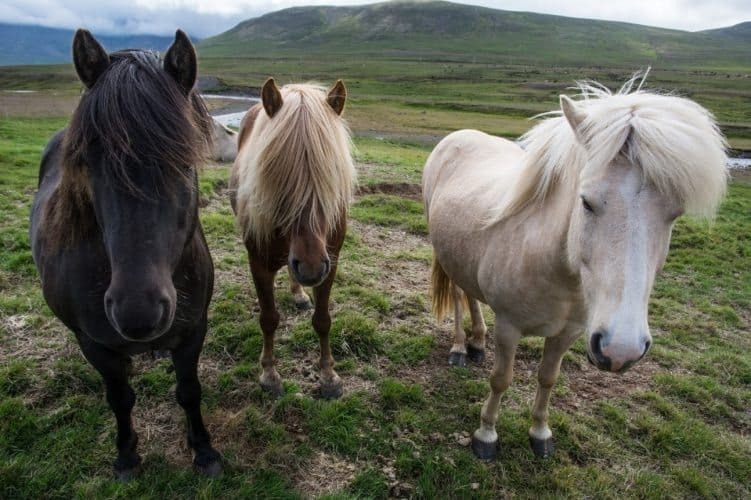 The photogenic Icelandic horses are found across the island. Their small but strong stature and luxurious locks make great photographic subject matter. One animal stood out from the others, its brilliant blue eyes a unique surprise. The horses are often friendly and would come over for a visit whenever I stopped for photographs. Driving around Iceland is easy. Highways are narrow but well maintained, and shoulders are steep, to accommodate snow removal in winter. Drivers should heed warnings about taking narrow gravel roads to the interior island. Many car rental companies forbid driving their vehicles on these rougher roads. Weather can be unpredictable, even during the summer, and driving and road conditions across the island can quickly change into hazardous situations. 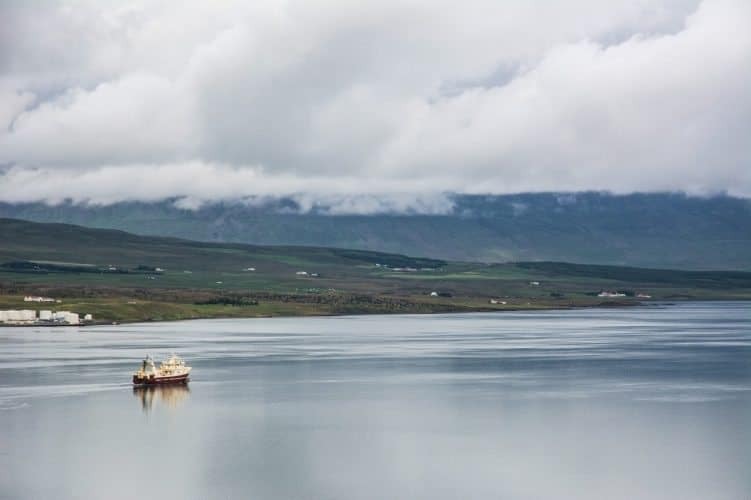 A fishing boat leaves Akureyri and heads out to the northern sea. Travelers are wise to research ahead about driving in Iceland, and rental insurance is recommended, as repairs are costly. Speaking from experience, it is a good idea to have the extra insurance. A minor run-in with a roadside marker left a tiny dent and a few scratches in my rental car. The estimate for repairs – $90,000 Icelandic Krona ($1,000 CAD) Luckily I had purchased insurance online a few days before my trip and almost the full amount was covered. Iceland is very safe to travel and residents are friendly and helpful. While costs in Iceland are among the highest in Europe, travel it is possible on a budget. Camping is inexpensive and there is so much to see that days can be filled with sights and experiences, none of them requiring an entrance fee. By being flexible and keeping an open mind to a different experience, any visitor can have an adventure in Iceland. Websites providing valuable information on visiting and camping in Iceland. 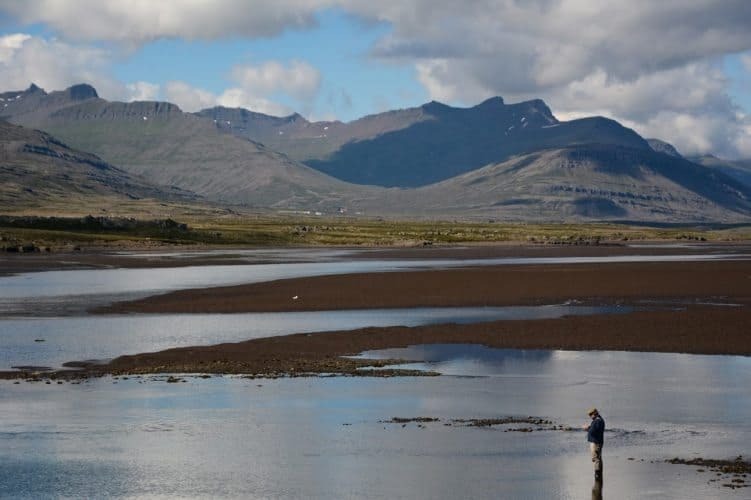 Fly fisherman try their luck along the northern coast. http://www.campingcard.is The camping card provides discounts on fees?? 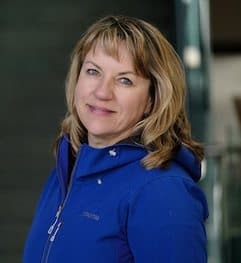 Once a journalist and now recently retired from law enforcement, Monica Schimanke loves to share her travel experiences through stories and photographs. She is based out of Alberta, Canada, but housesits around the world.